Yesterday I ran my fourth half marathon! 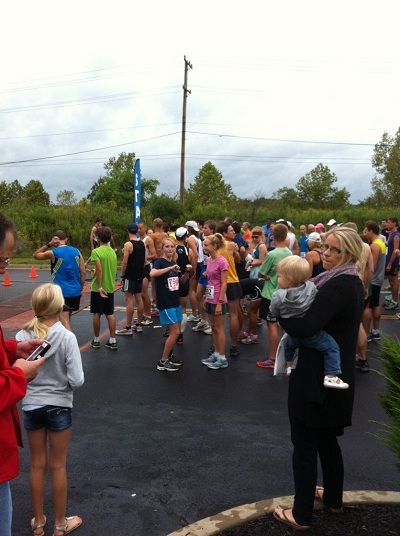 Course Description: 13.1 miles out and back on the (mostly flat) Montour Trail. The course also went through a tunnel, which was pretty fun. Race cap: 1,500 runners. 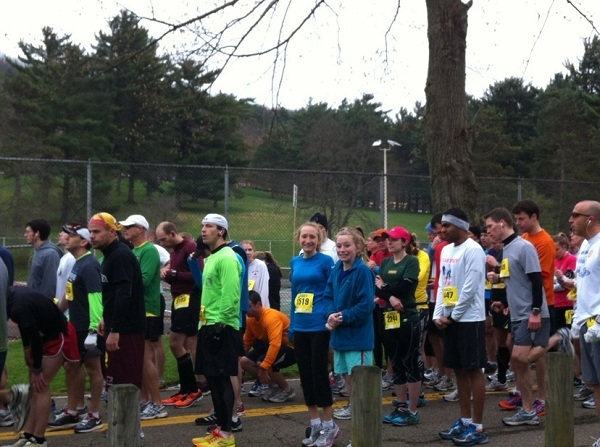 That many runners on a 5-foot wide trail was cramped! Weather: 67* with 90% humidity and a light drizzle until after I finished the race. About 15 minutes after I finished it was a torrential downpour with crazy wind. Hannah and I at the start. I’m wearing a pink shirt and she’s wearing blue. Hannah ran the 5k. A lot of people and stormy weather! The last time I ran this race, in 2010, I got a 1:42:58 (7:52 pace). 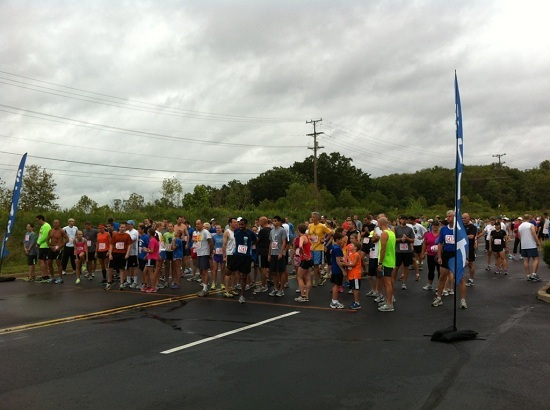 Post-race in 2010… much better weather! Funny story: my family dropped me off at the start and then went out to eat while I ran the half marathon. Cool life, family. 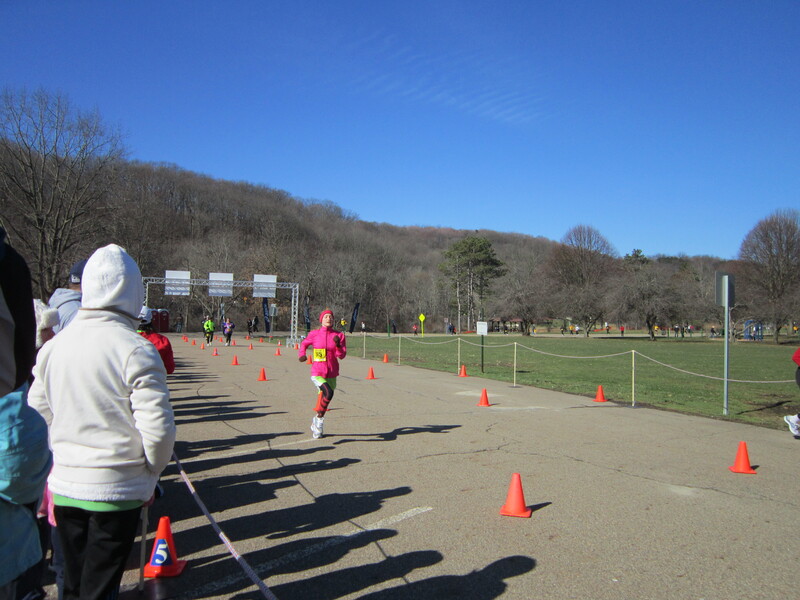 My second half marathon was frigid (17*) and I got a 1:46:16 (8:07 pace). 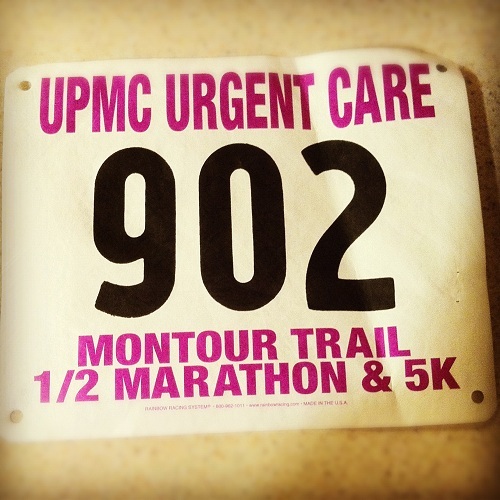 I was unable to run the Montour Trail half marathon last year because I was injured. I did run the same freezing cold half marathon that I ran in March 2011. I got a 1:41:32 (7:44 pace). So, that has been my half-marathon progression. My time has improved with each race (except in 2011… lolz) and I just enjoy running 13.1 miles. It’s a splendid time! One day I will convince Hannah to run with me so I’m not bored running by myself the whole time ;). Awesome job, your times are so fast for that distance! I am hoping for 150 or less for my November half *crosses fingers* and looking forward to cooler weather for it. Sounds like yours was pretty hot too with the 90% humidity, even with temps in the 60s. You did an awesome job, especially for trail and for such a large race. 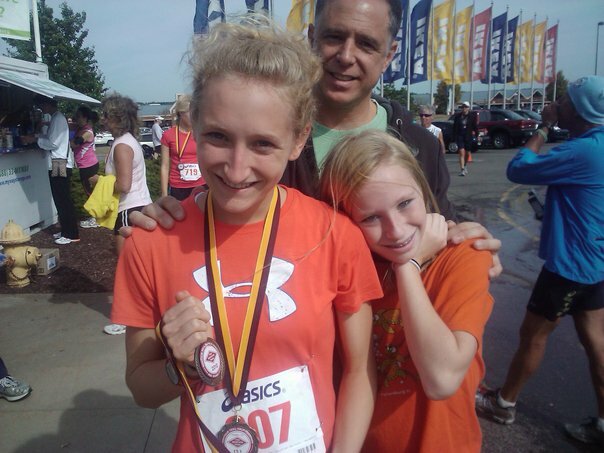 That’s neat that Hannah did the 5K and funny about your parents going out to eat. When I did my half I just told Clay about what time to be at the finish so he slept in and just got there when I was finishing, haha! Then he went home and slept more! Nice job Allie! I agree 13.1 is such a nice distance! Great job Allie! That’s a fantastic time! 🙂 Congrats on the PR! Oh jeez! That was ROUGH! I can’t believe it rained so hard. congrats girl! sounds like a blast. Sooo awesome that you got a best time! amazing race 🙂 You’re awesome! And Hannah is, too! Your times are redonculous! Congrats Allie!! !